If you think the most important work Bill Cosby has ever done included Jello Pudding Pops, then this is the fruit for you! Photo is courtesy of Specialty Produce. My old photo was terrible and when I bought more of these to take a better picture, I accidentally ate them all. Will try again next week. This is a grown up pudding cup inside lovely fruit shaped packaging. Messy, spicy, vanilla goodness. Delicious! Please excuse me while I go eat three more of these. The seeds are said to be fatally toxic if eaten raw by humans or animals. To eat, cut in half and scoop with a spoon. Don’t eat the skin. They are also known as custard apples. Years ago, lived in the Virgin Islands, where the Custard Apple is widely grown, very popular. It’s a terrific fruit, just as you described (once you can get past the skin that looks like it was designed by Home Depot). But high in calories! 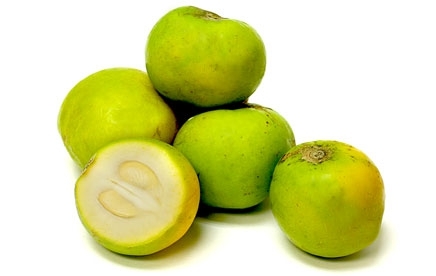 We had a white sapote tree in our back yard about 50 years ago. I found the fruit entirely too bland for my taste. There was nothing wrong with it, except the lack of any acidic “zing”.